Clacton Concert Orchestra’s Summer concert held at the parish church in St Osyth village on Saturday 16th July was very well attended and an altogether most enjoyable event. Two soloists were showcased, Katerina Venables – principal clarinettist with CCO, who performed with the full orchestra the 1st movement of Bernard Crusell’s 1st Clarinet Concerto. and guest player Anna Durance who performed Albinoni’s Oboe Concerto No 7. Anna played with the strings section of CCO, and with Frances Garland playing piano continuo. Both soloists were technically excellent, very musical and performed with great panache and style. The concert opened with Rossini’s overture The Thievish Magpie which beautifully imitated the impish magpie and culminated in a rousing finish. The second half of the concert was devoted to Dvorak’s Symphony No 9 “From the New World”, a huge work for this amateur orchestra to undertake. Conductor Francis Garland excelled himself, the attention to detail which he has brought to rehearsals paid dividends, the players under the guidance of their excellent leader Ruth Baker, were on top of the music and played with sensitivity and great feeling, responding to their young conductor’s firm hand on the performance. The Clacton Concert Orchestra’s Gala concert at Kingsway Hall opened with a gentle performance of the much loved “Morning” from Greig’s Peer Gynt Suite which settled the players in well. It is most refreshing to hear a contemporary composition especially one from a local, young composer. John Scott Cobb’s concerto for piano is dedicated to the memory of his former teacher the late Alison Baker F.R.C.O. (1962 – 2008) The soloist was Francis Garland CCO’s conductor and also a gifted pianist, whilst the composer took the baton with a firm hand and great attention to detail. There is remarkable skill in John Cobb’s orchestration, well illustrated in the first movement, and even more in his piano writing, all with a mature sense of musical structure and thematic development with its dramatic melodies and sweeping themes. The second and third movements were a true test of Francis Garland’s skills and he displayed his ability to great effect on the superb Bosendorfer grand piano brought in for the occasion. The orchestra under the skillful leadership of Ruth Baker, met the challenge of this contemporary piece and rose to it, each section was highlighted to great effect and the brass soared to dazzling heights. The concerto and its dedication caught the imagination of the listeners and by its end had may in the audience near to tears and the conductor, soloist and orchestra received a rousing ovation. The second half of the concert was Beethoven’s 6th Symphony in F major opus 68 “Pastoral” The opening Allegro began with a cheerful motif followed by a further 6 all depicted well by the various sections. The Beethoven harmonies came across well and led into the 2nd movement where the strings beautifully conveyed the opening flowing water motif. The cellos handling their muted and pizzicato sections to effect. Towards the end solo flute (nightingale), oboe (quail), and clarinet (cuckoo) were resplendent in their cadenza style imitation of bird calls. The 3rd movement returned to the home key of F major and one felt the momentum towards the abrupt end as the raindrops start to fall. The players built into a great climax with conductor Francis Garland keeping his nerve and never letting the tempo go adrift as the music built up into the thunderstorm in the 4th movement. The finale conveyed the beautiful theme of the Shepherd’s song in a joyful mood, the coda started quietly and under the up and coming conductor’s baton built gradually to a culmination of the full orchestra. The first violins under a faultless Ruth Baker were determined with their rapid dotted semi-quavers at the top of their range. The work concluded with two emphatic chords conveying from the players that they had indeed provided the audience with a well rehearsed rendition of a very intricate work. 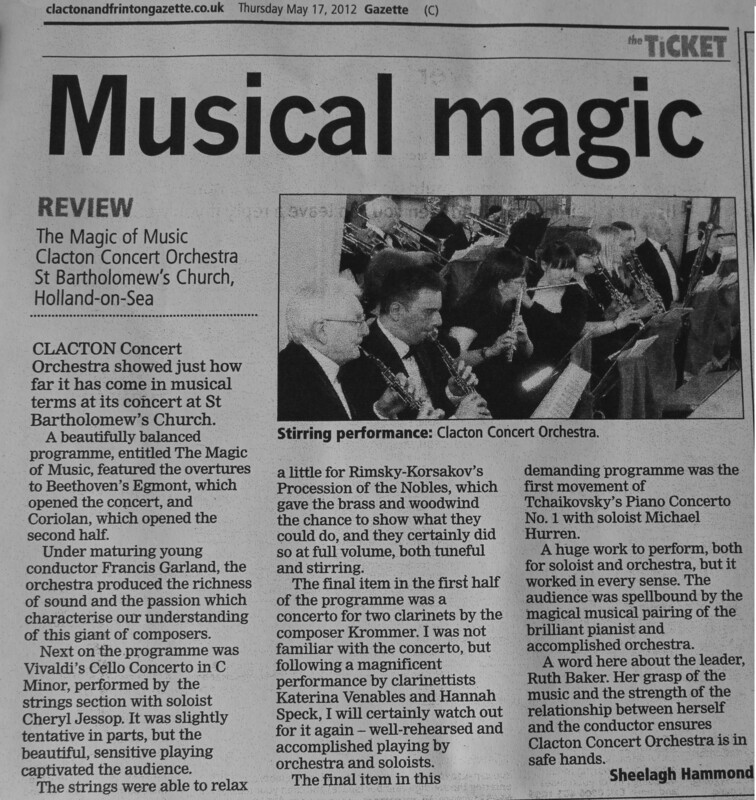 Clacton Concert Ocrhestra gave its first Gala concert of the year at Pier Avenue Methodist Church, Clacton on Sea. This was an important date in the life of this busy orchestra as it was to give the first public performance of a new composition. The first item however was that of a well-known and well-loved piece, “Morning” from Peer Gynt Suite by Grieg and a very creditable performance they gave. This was followed by the premier performance of a piano concerto by Colchester born John Scott Cobb. John is a versatile young composer and musician who has dedicated his concerto to the late Alison Baker in affectionate memory of this gifted pianist, organists and music teacher who influenced him and supported his talent before her tragic death after a long illness in 2008. The soloist was Francis Garland, conductor of the orchestra but also a gifted pianist whilst the composer took the the conductors baton. The work began with a lively bouncy start leading to dramatic melodies and sweeping themes, on the piano with exciting peaks and climaxes, the first movement ended with a movement both beautiful and lyrical. The second and third movements were a test of the soloist’s skill and Francis displayed his ability to great effect. The brass was bold and assertive and the timpani thrilling. The audience were obviously delighted with this new work and showed their appreciation accordingly. Such comments as “Wonderful”, “Amazing” were heard everywhere. It was a piece of music which will be eagerly listened to, hopefully many times. The concert concluded with Beethoven’s 6th Symphony “The Pastoral”. A fitting choice for such a lovely summer’s evening, tackled with great gusto and skill, by the players and conductor and under the skillful leadership of Ruth Baker. The gentle pastoral scene with the birdsongs played by the wind section really set the picture and led into the happy sounds of the “peasants merrymaking”. Like most balmy evenings, as we know all too well, this was swiftly followed by the ominous sounds of the thunderstorm, aptly pictured by the orchestra; with everyone contributing to an exciting climax, this as the storm dies away leaves us to the hymn of thanksgiving and a quiet, peaceful finish. This descriptive work was most ably played and well received, I really enjoyed the woodwind and the timpani was very exciting, I must particularly compliment Kate Ellis and Christopher Samuel in the ‘cello section for their beautiful playing. An excellent evening and much enjoyed. The concerto can be heard again on 17th July at Kingsway Hall in Dovercourt, where the orchestra are bringing in a full-sized grand piano, I urge you not to miss it! Just been to this concert by the Clacton Concert Orchestra: https://clactonconcertorchestra.com/2010/01/18/music-for-all-31st-january-2010-3pm/ round the corner from Clacton-on-Sea pier. I managed to get a seat not far from the various soloists: Jess Barton (clarinet – Mozart), Tracey Simmons (violin – Bach) and Michael Hurren (piano – Shostakovich). A musical experience to remember. The church acoustics and the orchestra were aberrantly productive, and I was particularly inspired by the almost Philip Glass-like rhythm of the D-Bass and cellos in the Bach. Mr Hurren’s red T-shirt and masterful managing of some thoughtful and masquerading piano notes still echo in my mind as I write this. Tracey Simmons’ Bach soared above even the seagulls. Jess’s Mozart was often deeply timbred and, to my non-technical listening, delightful. You can’t often experience such tenderly tentative as well as puckishly confident sounds so coolly complementing each other in an unexpected seaside scenario. You can’t experience them even in the best of concert halls in the capitals of the world. Only Clacton or places like it can distil beauty from the unlikeliest of converging amateur and professional opportunities. If Clacton is not yet proud of its own Concert Orchestra, it should be, after the latest concert at St. James Church recently. Not only are the technical abilities of the players improving, but the ensemble playing under the control of Francis Garland and the leadership of Ruth Baker becomes more secure with each performance. Their programme opened with The Procession of the Nobles by Rimsky Korsakov, in which the brass section took full advantage of their opportunity to shine. The opening flourish from the trumpets was, perhaps, a little tentative but the parade was soon underway in fine style, providing a vibrant introduction to the first movement of Mozart’s Clarinet Concerto. This was performed by Jess Barton, a regular viola player with the orchestra who is rapidly increasing her skills with other instruments. Jess met all the technical demands of her solo with confidence and we look forward to hearing more from her. The second soloist was Tracey Simmonds, who gave a performance of the Bach A Minor Violin Concerto, which was quite breath-taking, particularly in the slow movement which was beautifully controlled and expressive. The accompanying strings were quite clearly inspired by her confidence and gave splendid support producing a beautiful rounded tone. The Grand March from Aida by Verdi opened the second half in style, although not quite with the same verve as The Procession of the Nobles, but the following waltz from Katchaturian’s Masquerade showed the orchestra at its very best. The players obviously enjoyed this piece. The highlight of the afternoon was, of course, the two movements of Shostakovich’s Piano Concerto No. 2, performed by Michael Hurren. Being a well-known local musician Michael was given a warm welcome, and returned the compliment with a superb performance of the lyrical slow movement and the intricate last movement. The orchestra rose to new heights of playing, the whole being kept under superb control by the conductor, Francis Garland, who must take a great deal of credit for the success of a very ambitious concert. St James Church in Brightlingsea was full on Sunday afternoon for the concert given be the Clacton Concert Orchestra and what a treat it was! With at least thirty instrumentalists of varying ages playing in the church that has excellent acoustics it was a joy to sit and listen. Conductor Francis Garland and leader Ruth Baker took us through such a varied programme which incuded an illustrated musical journey through Peter and the Wolf. Themes from Wizard of Oz and the James Bond films, stirring Sousa Marches and many more. This was a special event for Brightlingsea the project having been funded by Grassroots Grants which is funded by the office of the Third Sector. Another triumph for the Orchestra-tremendous concert with augmentation and a solo spot from the Sweeting big band-at St Bartholemews church(Holland-on-sea)-well done to all concerned. Thank you for your support and nice comment, Jennifer. Yet another triumph at St Osyth parish church today-`the magic of music`-not only fine music, but a lovley social event. Thank you for your kind words, Jennifer.